He wears a boiled netch leather cuirass, netch leather pauldrons with matching boots, a left leather bracer, and some common pants. He carries a pair of common shoes along with a dire viperblade. Aside from his natural charm and ability to absorb fatigue from others, he knows the spells Blood Despair, Dire Weakness to Shock, Dire Weakness to Poison, Dire Weakness to Magicka, Dire Weakness to Frost, Dire Weakness to Fire, Viperbolt, Poisonbloom, Deadly Poison, and Sleep. "What is it, abomination? It is only because you have Berne blood in your veins that I do not kill you where you stand. The ways you may serve me are limited." "Hmmm... you wish to be of service? Very well. You are expendable. The Quarra Vampires are a powerful clan that makes their lair in Drucashti [sic]. Volrinna Quarra is their leader, a powerful vampire indeed. She draws much of her strength by drinking from the blood of her Quarra elders. Get me that Quarra Blood Potion, and I will allow access to the services here in Galom Daeus." I will serve you. "Hmmm... you will likely die, but so be it. Go then, to Druscashti, and bring me the blood I desire." I am not interested. "I expected no better. Leave me, I grow tired of you." "You will find it near Volrina Quarra, I would imagine. If you don't die first. Look for her in the Quarra lair in Druscashti." "Yes, little monster. What do you want?" "You have found it? You surprise me, clanless one As I promised, you may use the services here at Galom Daeus freely. Do not overstay your welcome." "Yes... it will make me more powerful. And the Quarra will die." "You wish to be of service once again, you ridiculous mistake? I will allow it, but only this time, and never again. If you wish, I have an errand for you." "There is a vampire, formerly of this clan living near Maar Gan. Merta was one of my most trusted lieutenants, until she decided to become a rogue and leave this clan. I wish her dead. She takes cattle that should rightfully be property of my clan. And she had the audacity to leave my service. Kill her for me." I will kill her for you. "Hmmm... you show some spirit. She will likely kill you. You will find her in a tomb to the west of Maar Gan, I believe the Reloth Tomb. Go now." I will not do this. "You are useless to me. Leave my presence." "As I said, she is a very powerful vampire living near Maar Gan. Look to the west of that city, in any tombs you may find. There you will find this rogue. She may be well guarded, but it is her you should concern yourself with. She must die for the disrespect she has shown me!" Returning with news of Merta's death. "You've killed her? Astounding! I expected you dead by now. Perhaps you have some potential, you horrible accident. Here is an amulet. It will allow you to return to Galom Daeus if you have need to. Kill some of the other clans' [sic] worthless vampires, and perhaps I will have future rewards for you. Speak with me no more. I have no more need of you." "Kill more of the Aundae and Quarra, and perhaps I will have something more to give to you." "It is good she is dead." "You have killed many of the opposing clans' vampires. This is good. As a gift to you, I will allow you use of the cattle we keep here at Galom Daeus. Do not feed too much, though. If one dies by your hand, you will no longer be welcome here." "I will have no more to do with you. Leave my presence while you still please me." Raxle Berne shares Berne Clan-specific dialogue with the rest of the Berne Clan vampires. 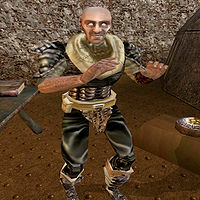 Raxle Berne also appears in the Houses of Morrowind card expansion for Legends as the card Berne Clan Nightstalker. This page was last modified on 11 March 2019, at 19:53.